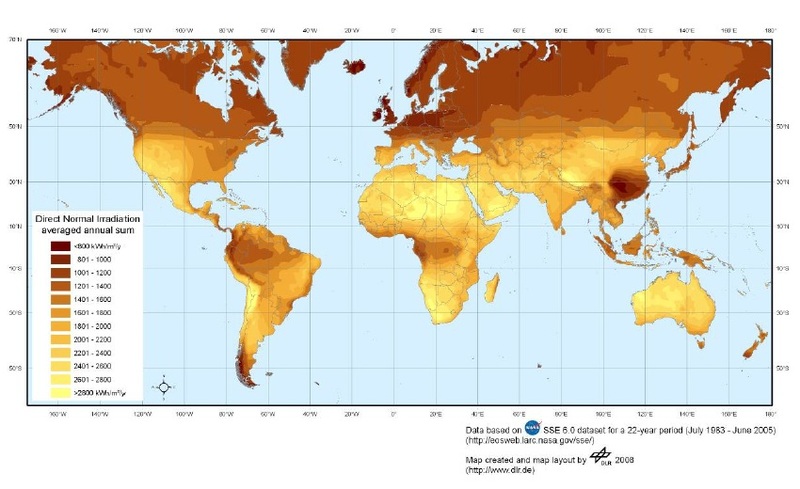 What parts of the world get the most sunlight? What parts of the world have the best potential for solar energy developments? Desert regions like the Sahara and Death Valley seem like obvious locales, but they’re not the only places on Earth to receive a wealth of sunlight. Scientists and engineers use a measure of “direct normal irradiation” (DNI, also called “direct insolation” or “direct solar irradiance”) to assess a region’s potential for generating energy through photovoltaics or concentrating solar power (CSP). DNI is that portion of sunlight that directly strikes the Earth’s surface after absorption and scattering losses in the atmosphere, and is measured in kilowatt-hours per square meter per year (kWh/m²/y). And what parts of the world have the highest levels of DNI? A 2009 study by the German Aerospace Center on the “Global Potential of Concentrating Solar Power” identified the areas with the greatest potential after eliminating developed or protected spots like settlements, airports, oil and gas fields, farms, swamps and bodies of water.